To enroll in a PADI Open Water Diver course or Junior Open Water Diver course, you must be 10 years old or older. You need adequate swimming skills and need to be in good physical health. No prior experience with scuba diving is required.® Open Water Diver course – the world’s most popular and widely recognized scuba course. Millions of people have learned to scuba dive and gone on to discover the wonders of the aquatic world through this course. PADI's Online Training program is designed so that you can learn the academics at your own pace when it is convenient for you. 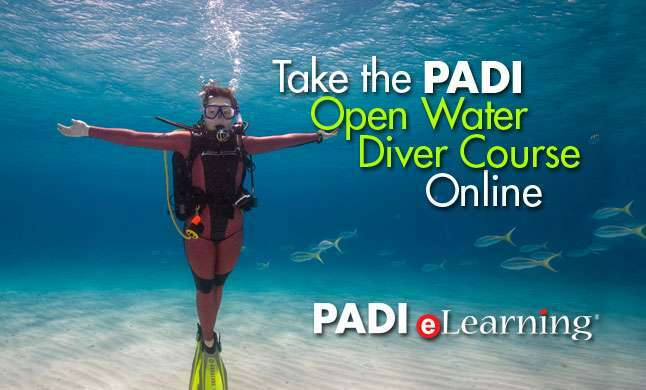 You can complete the academics online or at your local PADI Dive Shop or Resort. When you're fitted with your scuba equipment you can begin your pool training. Your instructor will put into practice the techniques you learned in the academics program. Your training dives will be logged and approved by your instructor before you move on to open water. Get ready to experience everything you've learned with the freedom of open water. As soon as your open water training dives are approved by your instructor you will be a certified diver. PADI Open Water Diver certification is recognized worldwide so your diving experiences will be limitless. There are no events on this date. Please choose another date.